Despite 4K TVs, 4K gaming, and 4K streaming taking over as That Next Big Thing, demand for devices capable of playing 4K Ultra HD Blu-rays has gone relatively unmet. Though known nowadays for mobile devices like the Oppo F1 and F1 Plus, Chinese electronics division Oppo Digital is no stranger to home cinema tech. 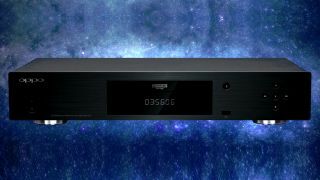 In fact, the company is throwing its hat into the otherwise sparse ring with the UDP-203, its first crack at a 4K-compatible UHD Blu-ray player. Oppo announced via Facebook today that it aims for the UDP-203 to hit stores at the end of the year. The company stipulates that the holiday release window is tentative, however, as the company is more committed to meeting its standards for quality than a deadline. Despite 4K's major buzzword status, few companies have gone all-in on UHD Blu-rays, leaving only a handful meeting demand for disc-based 4K movies. Even Sony - a major proponent of 4K and pushing new media formats - is still a ways out from releasing its own UHD Blu-Ray player. Additionally, the company controversially left out UHD Blu-ray functionality from its upcoming 4K-capable PS4 Pro console. Meanwhile, Oppo isn't holding punches, as the UDP-203 comes packed with Dolby Vision HDR support, dual HDMI and USB ports, and bitstreaming audio for fans of Dolby Atmos. While offering 4K movie fans more choice and power, the UDP-203 isn't aiming for 'cheap.' Oppo currently marks the machine at $499 (about £380/AU$660), meaning those looking to save money when upscaling their movie library may prefer Philips' UHD Blu-rau player, or even the Xbox One.